Petri dish with colonies of the dangerous hospital pathogen Acinetobacter baumannii. Cases of multi-resistant bacteria in hospitals have increased dramatically in recent years and the health system faces tremendous problems as a result. Alongside “old acquaintances”, such as Staphylococcus aureus (MRSA) or Klebsiella pneumonia, another pathogen has now arrived on the scene: Acinetobacter baumannii. In order to find new weapons for the fight against this aggressive germ, in 2014 the German Research Foundation established a Research Unit led by Goethe University Frankfurt which has now been extended for a further three years. Infections with Acinetobacter baumannii are often fatal due to this bacterium’s increasing antibiotic resistance. In some European countries, over 90 percent of isolates no longer respond to antibiotic therapy. Particularly worrying is the fact that the pathogen is continuing its rapid advance throughout the whole world. 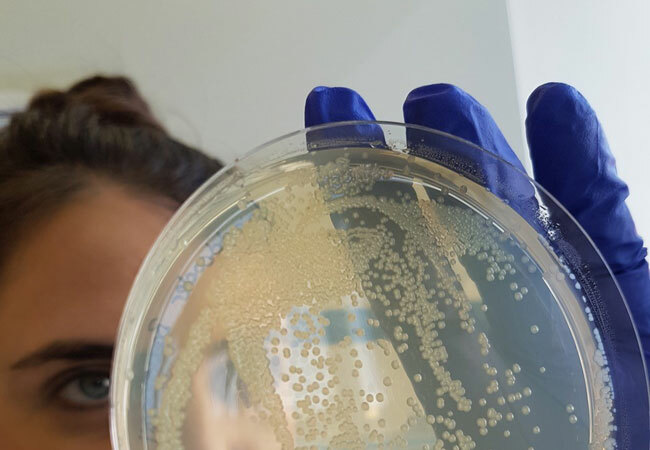 In order to obtain results in this situation that can be put to use as quickly as possible in clinical practice, natural scientists and physicians are working closely together in the Research Unit “Adaptation and Persistence of Acinetobacter baumannii”. Several institutes at Goethe University Frankfurt – Molecular Microbiology & Bioenergetics, Medical Microbiology & Infection Control, the Institute of Cell Biology & Neuroscience and the Institute of Biochemistry – are involved in the project together with the Robert Koch Institute and the universities in Cologne and Regensburg. “We have achieved something quite unique: We use patient isolates, sequence their genome and analyse their pathogenic properties, which are then characterized with regard to countermeasures,” explain Professor Volker Müller, microbiologist, and Professor Volkhard Kempf, microbiologist and physician, who are the Research Unit’s two spokespersons. It has already been possible to identify first virulence traits by means of this approach. The researchers know meanwhile what the bacterium feeds on, how it survives stress, how it adheres to animate and inanimate surfaces and how it withstands antibiotics. This knowledge enables them to test new targets for deactivating the bacterium. They discovered, for example, that bacteria are no longer able to trigger infections if you take away their ability to synthesise a certain sugar (trehalose). The research team is now working hard to shed light on this sugar’s biosynthesis process so that inhibitors can be developed. The evaluators found this work so convincing that the German Research Foundation has not only extended the project but also increased its budget. The work undertaken in future will produce new answers to the question of how this increasingly threatening bacterium can be treated.